Meribel belongs to one of the best ski areas in the world - the resort is located in the heart of the «Three Valleys». Choosing it a place of your rest, you get the opportunity to ride along the Courchevel, La Tagne, Brill-LeBen, Les Menuires and Val Thorens, united by a single ski pass. This resort in the heart of the Three Valleys for many years remains a hit of sales among ski tourists from all the world. Convenient location in the center of a huge ski area, excellent opportunities for skiing, ski safari and freeride, a modern system of cable cars - Meribel has almost everything to consider it almost the ideal ski resort. In the commune of Le Allu, the department of Savoie France Meribel is located near the town of Moutiers. Established in 1939, it is the resort with a height difference in the range 1450-1800m with small villages Meribel-Mottaret, Merribel and Le Allu. Meribel is the most refined architectural style resort of the French Alps. It consists of a central part, Belvedere and Mottaret, connected by elevators and roads. A lot of routes with the wide difference of complexity among the picturesque landscapes of the French Alps attract to Meribel as lovers of skiing along the well-groomed pistes and lovers of virgin land. The development of the ski resort Meribel began after the first lift appeared in 1938. The central position in the Three Valleys provides Meribel's special popularity. 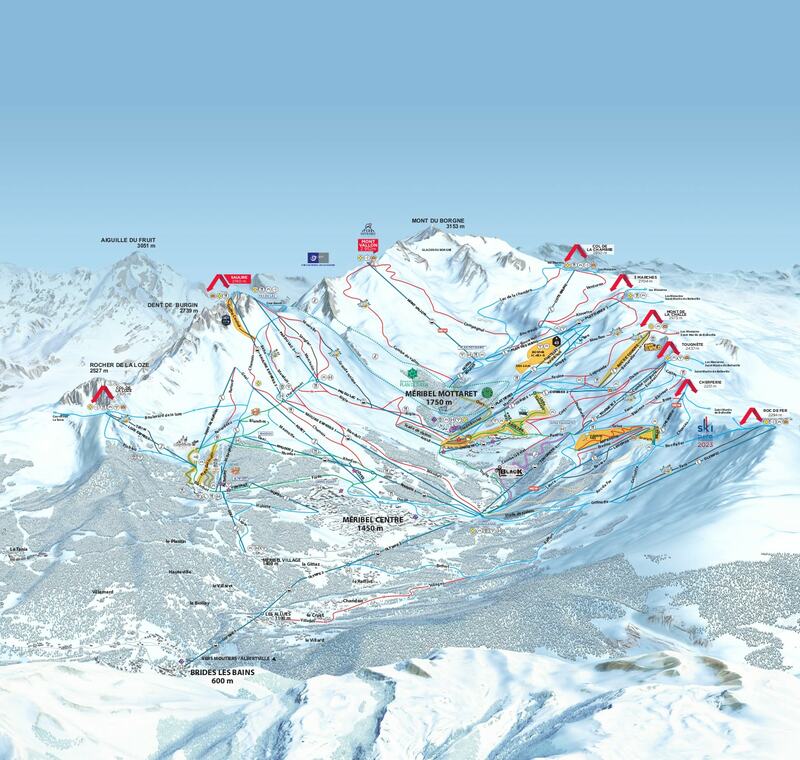 From here it is convenient to get to such ski resorts as Courchevel and Val Thorens. When you are traveling to Meribel, you can always count on the most dynamic and flexible pricing system. Alps2Alps do everything possible to low the transfer costs for our customers. Every detail of your trip will not be left without our attention and we will offer you the most possible beneficial price for you and your travel group, at any time of the year for the way to your best vacation at Meribel resort. Alps2Alps will guaranteed deliver you to Meribel with maximum comfort and reliably and at the lowest possible price. We never overstate our prices at any time or for any reason. Besides, we are ready to offer you very significant discounts for the transfer in off-season period and on mid-week days. If you are looking for the best transfer services at the best price, be aware that traveling outside the peak season or in the middle of the week will let you save on the services as much as possible. We offer prices from Monday to Friday with a discount of up to 60% than on weekends. The final price of your resort shuttle will also depend on the availability of the car, the transfer schedule, the use of the vehicle and some other costs, such as tolls and parking fees at the airport. If you have specific requirements or you want to clarify information, for example, you will travel in a large group, please contact us directly so that we can discuss all the details of your future transfer. Three Valleys is the largest ski area in the world and a Mecca for skiers. Meribel has a huge number of shops, cinemas, nightclubs, restaurants, bars and cafes. Here is one of the biggest ski schools - Ecole de Ski France - Meribel ESF - 400 instructors with the knowledge of foreign languages. There are kindergartens for children aged 4-5, group and individual classes for children and adults. Finally, a large sports complex with a lot of entertainment Apres-ski. No wonder that many tourists who have visited Meribel reward this place with the most enthusiastic epithets: "the palm tree of the championship" rightfully belongs to this magical resort. Alps2Alps is committed to providing a full package of high-quality transfer services and the lowest prices. When it comes to reliability, punctuality and flexibility, you will not find a better solution than Alps2Alps. Book your transfer in advance in order to take a benefit of the lowest possible prices and tranquilly wait for your holiday. As always, do not forget to contact our team if you can’t find the resort or service that you need, on our website. Book your transfer and let it be the best start of your dream vacation!